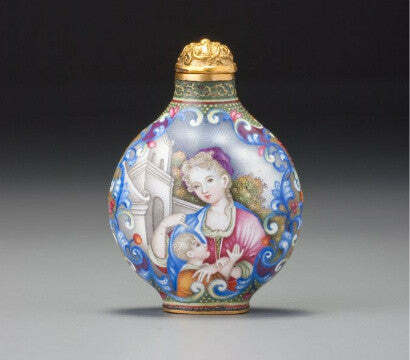 Bonhams will sell 140 snuff bottles from the unique Bloch Collection in Hong Kong on Friday (May 28). This collection is the world's largest and finest in private hands, comprising 1720 exceptional examples of these Chinese 'miniature masterworks'. The auction includes an Imperial enamel-on-copper snuff bottle, personally commissioned by the Qianlong Emperor for his own use in the Forbidden City in Beijing. This stunning and rare object is estimated to sell for £250,000, and is one of the finest and rarest examples of this highly regarded Chinese art form ever to be offered at auction. The habit of using ground tobacco (snuff) was introduced to Asia by 17th century Western travellers from Europe, where it was an exotic import from the Americas. Chinese snuff takers found that traditional Western snuffboxes did not work well in the humid climates of Asia, and from the later 17th century Chinese craftsmen created small airtight bottles to keep the ground tobacco in perfectly dry condition. These bottles became expensive luxury goods in their own right, not just for their contents. Produced by some of the country's leading artists, they were given as gifts and tributes to the Emperor and others of the ruling classes. Snuff bottles soon assumed a value as status objects, and were produced from a variety of traditional Chinese artistic media; lacquer, porcelain, agate, jade, glass, ivory, and enamel-on-copper. A certain number were superbly crafted for a demanding audience familiar with outstanding works of art. The Bloch collection contains a remarkably wide range of these top-quality bottles. As a growing number of collectors vie for the best snuff bottles their value has been growing. Over the past decade prices have increased fourfold making them a highly portable alternative investment. One bottle recently sold at auction for over US$800,000, reflecting a remarkable surge in prices at the top end of the market. "Bonhams is greatly honoured to be selling snuff bottles from this world famous collection whose contents span three centuries of top-level Chinese craftsmanship," said Colin Sheaf, Chairman of Bonhams Asia, and also head of Asian Art. "Every knowledgeable and committed collector of Chinese art will be keen to own one or more of these snuff bottles as they represent the best of the best, which is a tribute to the discerning eye of their collector. We previously reported on some other exceptional lots from Bonhams' sale of the Bloch Collection, here.